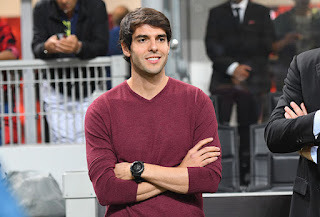 Former Brazil star Kaka has revealed his thought on Ac Milan new plan to sign Paqueta from Flamego for €35million, as well as his potential future with the club. "Paqueta is a player who has a bright future ahead of him, he is a player of great perspective and he has already been called to the Brazilian national team. In his case, it is better if we don't make any comparisons. I have seen that these days he has been compared to me, to Pato, to Ronaldinho, Cafu, Rivaldo and with all the Brazilians who have been part of Milan's history. To allow him to grow, let's keep quiet and avoid overloading him. I'm confident that he will become a great player. "My future? I spoke with Leo and Paolo. Lately, I have gotten closer to Milan because there are some friends there, but right now I want to stay close to my children Lucas and Isabella aged 10 and 7. I am doing a sports management course. I hope that one day I can work at Milan, the role would be that of a sports manager, but for now, there are only contacts, an effective role is still not there."